UN peacekeeping is continuously evolving. The scope and complexity of the activities conducted in multidimensional operations and the need for efficiency in the use of resources require that a professional approach be taken to the way in which operations are managed. UN peacekeeping policy and guidance represents a body of knowledge that supports peacekeeping personnel in the implementation of their tasks. It provides direction and helps streamline work processes. All policy and guidance materials are based on good practices and lessons from field operations and are regularly reviewed. Here you can find key peacekeeping policy and guidance materials. United Nations Peacekeeping Operations: Principles and Guidelines ("Capstone Doctrine"): This document sets out the guiding principles and core objectives of UN peacekeeping operations, as well as the main factors contributing to their success in the field. It also provides a basis for the development of training materials for military, police and civilian personnel preparing to serve in the field. The document draws on peacekeeping practices; seminal documents such as "An Agenda for Peace" (A/47/277-S/24111), Supplement to an Agenda for Peace" (A/50/60-S/1995/1) and the "Brahimi Report" (A/55/305-S/2000/80), as well as internal lessons learned materials, external research and academic commentary. Planning Toolkit: The Planning Toolkit is intended to help field practitioners in conducting assessments and planning of DPKO-led operations. It provides guidance, templates, checklists and lists of examples of good practices to help develop a wide variety of plans, ranging from a UN-wide Integrated Strategic Framework to the mission results-based budgeting and planning. Awarding the Captain Mbaye Diagne Medal for Exceptional Courage: The purpose of these Guidelines is to set out detailed procedures to be followed when awarding the Captain Mbaye Diagne Medal for Exceptional Courage for acts of bravery that United Nations personnel and associated personnel have undertaken while fulfilling their mandates, at great risk to their lives. The medal is named after Captain Mbaye Diagne of UNAMIR1 and of Senegal who saved, unarmed and in the face of extreme danger, hundreds of, or perhaps even a thousand, of Rwandans from death during the 1994 Genocide’. Policy on Protection of Civilians: This policy provides the conceptual framework, guiding principles and key considerations for the implementation of protection of civilians mandates in UN peacekeeping operations. Protection of Civilians in UN Peacekeeping: The Manual describes the United Nations (UN) Military Police Unit, focusing on Military Police support to a UN Mission and Force Headquarters. Always scalable in size, modular in function and Mission-tailored, the UN Military Police unit’s size and composition depend on the size, composition and requirements of the UN Mission it supports and the physical characteristics of the Mission area. DPKO-DFS Gender Forward Looking Strategy: This strategy highlights the link between peacekeeping and DPKO/DFS commitments to the effective promotion and achievement of gender equality in peacekeeping. Gender Responsive UN Peacekeeping Operations Policy: This Policy is designed to guide DPKO and DFS on how to operationalize gender equality and the Women, Peace and Security (WPS) mandates, as guided by the eight Security Council Resolutions. UN Infantry Battalion Manual (Vol. I) (Vol. 2): The manual provides peacekeeping battalion commanders, their staff, company commanders and sub-unit leaders with a reference guide in support of their planning and conduct of operations to execute a UN mandate. Handbook for Judicial Affairs Officers in UN Peacekeeping Operations: The handbook is intended to serve as a “textbook” for UN judicial affairs officers working in post-conflict environments and provide reference guide for use prior to, and during, their deployment in the field. Prison Incident Management Handbook: The handbook is intended to provide guidance to UN corrections officers and other partners that assist national prison authorities in addressing the many prison security challenges. UN Police in Peacekeeping Missions and Special Political Missions: The Policy spells out the core functions of United Nations police peacekeeping and the fundamental principles guiding its activities. By defining core functions and fundamental principles, the Policy guides assessment and planning processes and informs other mission components as to how United Nations police approach the implementation of their mandated tasks. UN Peacekeeping Missions Military Police Unit Manual: The Manual describes the United Nations (UN) Military Police Unit, focusing on Military Police support to a UN Mission and Force Headquarters. Always scalable in size, modular in function and Mission-tailored, the UN Military Police unit’s size and composition depend on the size, composition and requirements of the UN Mission it supports and the physical characteristics of the Mission area. Police Capacity-Building and Development: Guidelines on Police Capacity-Building and Development spell out the fundamental principles and approaches to police capacity building and development in post-conflict countries and other crisis situations. Prison Support in UN Peace Operations: The Policy defines the core functions and principles guiding the activities of prison or corrections components of United Nations peacekeeping operations. It outlines the purpose, roles and scope of activities of prison components, as well as basic management and support arrangements, and other institutional relations with key partners in this area. Police Command in UN Peacekeeping Operations and Special Political Missions: The Guidelines assist United Nations police command staff in carrying out their duties and leading the police component in the fulfilment of mandated tasks, which can include capacity-building and development and/or operational support to host-State police and other law enforcement agencies, as well as interim policing and other law enforcement duties whenever executive authority is mandated. Police Operations in UN Peacekeeping Operations and Special Political Missions: The Guidelines are designed to assist police components in the fulfilment of their mandated roles, including operational support to host-State police and other law enforcement agencies, as well as interim and other law enforcement duties whenever mandated. Police Administration in UN Peacekeeping Operations and Special Political Missions: The Guidelines spell out the fundamental areas that fall within the scope of responsibility of a police component’s Administration Pillar. They are designed to provide Heads of Police Components, Police Chiefs of Staff, contingent commanders and other senior staff with a clear understanding of what police component administration entails, how it is organized, and how it fits within the everyday functioning of a United Nations field mission. Lessons learned on combatting impunity in the Democratic of Republic of the Congo: This report reviews efforts undertaken by the UN Mission in the Democratic Republic of the Congo (MONUSCO) through Security Council resolution 1925 (2010) to establish Prosecution Support Cells to assist the FARDC military justice authorities prosecute people arrested by the FARDC. Policy on justice support in UN peace operations: This policy defines the approach and principles that guide the justice compontents of UN peacekeeping operations, led by the Department of Peace Operations, and special political missions, led by the Department of Political and Peacebuilding Affairs. Civil Affairs Handbook: The first edition of the document providing detailed guidance for Civil Affairs Officers on how to perform their tasks. The handbook can be a useful orientation for anyone interested in finding out more about civil affairs work in UN peacekeeping. Environment Strategy (2018): This strategy was launched at the end of 2016 and sets out the context behind environmental management in international peace operations, establishing a vision for performance that DFS will strive to achieve within the next six and a half years. An update of progress during the first year of implementation – 2017 – is available here, together with a collection of good practices that have been introduced in peacekeeping missions during this time. 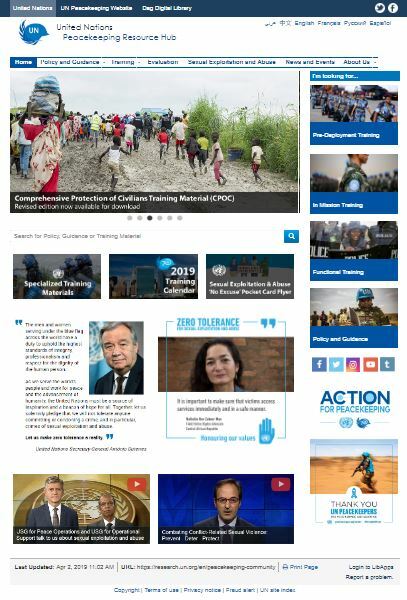 The Peacekeeping Resource Hub serves as a repository for all official DPO and DOS training and guidance materials, and provides links to other related UN documents and resources.